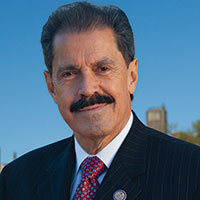 Congressman José E. Serrano represents the Fifteenth Congressional District of New York in the Bronx. Early in his tenure in the House, Serrano quickly established a legislative record that reflected, and continues to reflect, his core political values of equal opportunity and fair treatment for all citizens. In particular, Serrano believes that government should work to ensure that the prosperity of our country is shared by the neediest and most vulnerable members of our society- the poor, the elderly, the disabled, and children- in the form of participation in government, educational opportunities, access to housing and affordable health care. In 1993, the Congressman joined the exclusive House Appropriations Committee and currently serves as Ranking Member of the Subcommittee on Commerce, Justice, and Science. This prestigious post as top Democrat on the Subcommittee allows Congressman Serrano to help oversee the budgets of multiple agencies, including the Department of Justice; the Department of Commerce; the National Science Foundation; NASA; the Legal Services Corporation, and other agencies. As a Member of the House Appropriations Committee, Serrano has managed to secure millions of dollars in federal funding for his Bronx Congressional District. He has directed funding to countless local initiatives, including environmental projects, improvements to Bronx parks, educational programs for disadvantaged students and displaced workers and funding for various local charitable organizations, whose goals range from providing access to the arts to developing small businesses. Congressman Serrano is also Senior Whip for the Minority Whip operation, a position through which he helps develop strategies to marshal support for party positions and legislation. He is the Dean of the Congressional Hispanic Caucus and served as Chair of the Caucus from 1993-94. He is currently the most senior Hispanic Democrat in Congress, as well as the longest serving Puerto Rican in Congress.